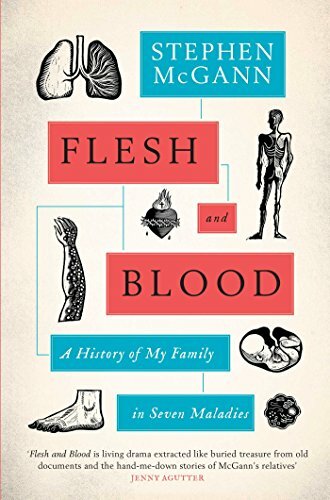 Flesh and Blood: A History of My Family in Seven Maladies, to give it its full title, is not your average celebrity autobiography. Stephen McGann will be well known to many for his acting roles over the years and most recently as Dr Turner in Call the Midwife. The book isn’t really an autobiography but more a combination of different subjects: part history, part autobiography, part medical references. Stephen McGann has written about his McGann ancestors from the time when they left Ireland during the Potato Famine, following them through living in desperate poverty in Liverpool, living and fighting in the world wars, right through to his own life and career. I went to see Stephen McGann at the Edinburgh International Book Festival this year as, having researched my own family, I was really interested in the sound of the book. My daughter (also a Call the Midwife fan) came too and this was one of her first book festival events. It was honestly one of the best book festival events I’ve been to. Stephen McGann was so enthusiastic about his subject and fascinating to listen to. I have to be honest and say I hadn’t actually planned to get the book but after listening to him talking about the book and reading from it, my daughter and I both agreed that we just had to buy it and get it signed. I think it’s testimony to how engaging he was that none of the questions from the audience were about his acting career but all were about his book or genealogical research. This book grew out of Stephen McGann’s research into his family’s history looking at census and birth/marriage/death records. As anyone who has ever researched their own family will tell you, these give only the bare bones and is the start of a very addictive process. There are always more questions than answers when you look at a document such as a birth or death record or follow a family through the census. It gives no more than a snapshot of that moment. This book is an attempt to add more detail to the McGann family history. Looking at death records in particular from years gone by reveals illnesses which either no longer exist at all or can be treated now. The author has chosen seven illnesses or maladies which have affected his family over the years and used them to look at social history and the history of medicine during these times. It’s a truly fascinating read. Each chapter begins with a medical explanation of the particular malady being looked at such as hunger, trauma or heart problems. Then the author moves on to looking at the history of a generation of his family through a particular record and examines the social issues affecting them at this time. Each chapter ends with a more personal testimony, relating the malady to someone in his family affected by it. For example, an uncle affected by hunger in a prisoner of war camp, the author’s own experience at Hillsborough, his brother in-law’s death at a young age. I was delighted and almost as excited as the author to read about a connection to the Titanic. Truly, as he says, genealogical gold! I found the history and testimony in the final chapter, looking at his marriage, the birth of his son and his wife’s illness very moving indeed. His love and pride for his wife and son come across strongly in this emotional and deeply personal chapter. I don’t read non-fiction very often but thoroughly enjoyed this very well written and absorbing book. The author has brought together medical history, genealogical research, social history and personal experience in a fascinating book which for me was as much a page-turner as any thriller. Flesh and Blood: A History of my Family in Seven Maladies is published by Simon & Schuster and is available now in hardback and as an e-book with the paperback to follow in January. You will find it in all good bookshops or you can order a copy online here. Some of them became soldiers serving in Gallipoli and on the Western Front. Flesh and Blood is the story of the McGann family as told through seven maladies – diseases, wounds or ailments that have afflicted Stephen’s relatives over the last century and a half, and which have helped mould him into what he now perceives himself to be. It’s the story of how health, or the lack of it, fuels our collective will and informs our personal narrative. Health is the motivational antagonist in the drama of our life story – circumscribing the extent of our actions, the quality of our character and the breadth of our ambition. Our maladies are the scribes that write the restless and mutating genome of our self-identity. I think that meeting the person you’re reading about has added impact too. Sounds really interesting. He really is great to listen to. This sounds fascinating Joanne! I might treat myself to a copy! Now this is a book I am definitely going to read, looks fascinating! I just might have to get myself a copy of this one before I go to see him next month. You’ve made it sound fabulous. I am sure you will enjoy both the book and listening to him talk about it.